In a previous post on the historical "stocks" of wealth in Japan and the US, I promised a post on the flows, i.e., aggregate income (GDP). I imagine someone must have posted versions of these before but for some reason I haven't come across them (just charts for recent quarters). Here are three longer-term charts followed by some comments. Technical Note: The US data appears inconsistent if you compare the quarterly chart to the annual one. This is unmodified data directly from BEA's site so I have not introduced errors. It appears their annual data uses an average value of each flow (GDP, consumption, etc) for within each labeled year, rather than the end of year value. 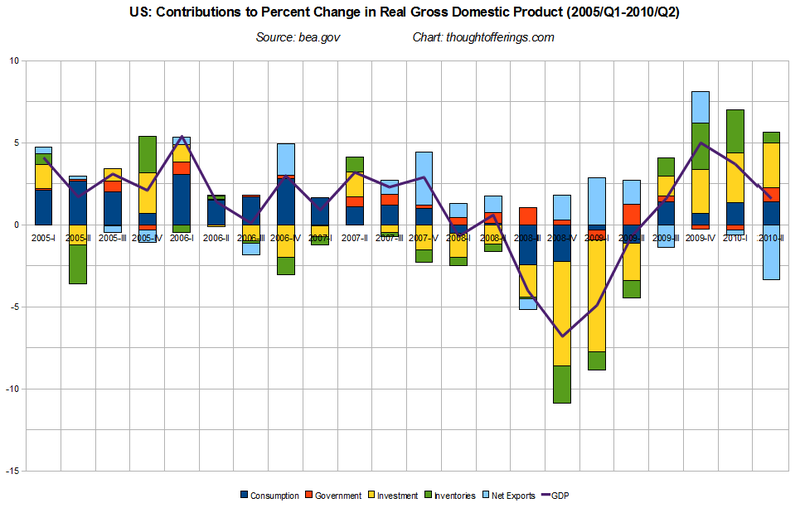 This would explain why, for example, the change in GDP for 2008 appears to be flat (i.e., 2008 average compared to 2007 average, rather than comparing end of year values) while the quarterly data confirms the plunge that was taking place in the second half of 2008. Despite slowing in the early 1990s, real GDP in Japan only contracted in a single year — 1998 (at least, up until the 2008 global financial crisis). So far the US will only have experienced [just over] a year of actual contraction, though it was deeper. There is of course still the risk of "double dip", i.e., renewed contraction. Household consumption made a positive contribution to growth in Japan in every year except 1998, despite slowing after 1990 from over 2% to below 1%. In the US, consumption's contribution has been negative five out of six quarters starting in Q1 2008, but has since been positive in the quarterly data. Even if it remains positive in future quarters and years (TBD), it seems likely that ongoing deleveraging will cause the rate of increase to be smaller than the roughly 2% rate in the housing-bubble-and-home-ATM 2000s, which was in turn slower than the 1990s rate that ended at over 3% annually in the "new economy" tech bubble years. Japan's household consumption was likely also supported by the fact that the household savings rate fell from around 13% in 1990 to around 3% in 2006. The US household savings rate is around 6% now, and unlikely to match Japan's decline (as it would have to go quite negative!). So it remains to be seen whether government deficits (boosting income) instead provide sustainable support for household consumption growth. Note that the measure shown is direct government spending, investment, and inventories, so it may be significantly less than the total government deficit during the same period. Hence these charts don't show the effect of the government giving the private sector more money to spend as it [the private sector] chooses, through lower taxes, larger transfer payments, etc. 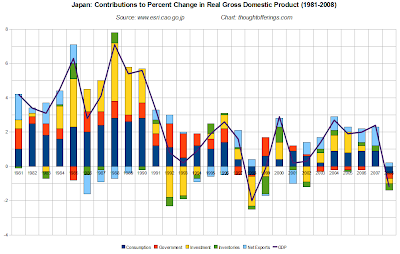 Government spending growth represented about 0.5% to 1% of annual real GDP growth through most of the 1980s in Japan, and this increased a bit to over 1% in 1992 and 1993, likely in response to the deflating stock and real estate bubbles. (Were there large fiscal stimulus packages during these years?) Perhaps government spending going negative in 2007 is what helped tank the Japanese economy by 1998 — Richard Koo has mentioned pressure at that time to reduce government deficits and that this of course made the situation worse! The mid 2000s in Japan actually saw direct government spending contracting mildly each year. In the US, government spending has grown every year except 1993, though at generally less than 0.5% of GDP it is not huge relative to other growth factors. Looking at the post-2007 recession and crisis response spending, the contribution is surprisingly small, at less than 1% in all but two quarters, and sometimes even negative! 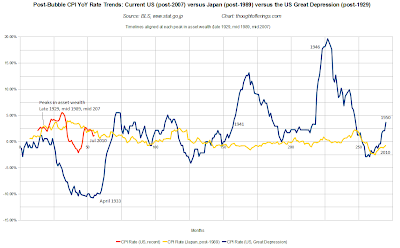 Part of the explanation is that this total includes state and local governments which have contracted to offset some of the federal spending, but the other possible partial explanation is that the Japanese may have been more aggressive in post-asset-bubble direct government stimulus spending (again ignoring tax cuts and other ways of government sustaining demand). Private sector investment includes residential housing construction, commercial real estate, software, equipment, and other capital formation. 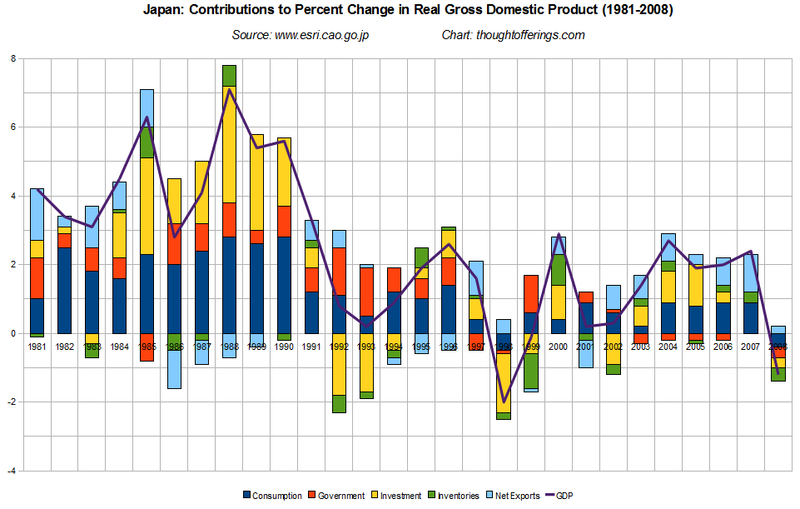 In Japan's late 1980s bubble, private investment contributed between 1.3 and 3.4 points to GDP growth each year. 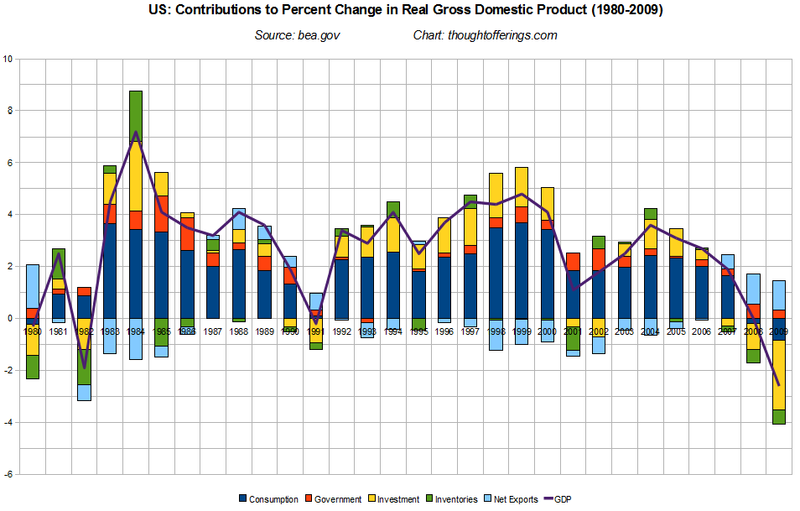 After slowing in 1991, it contracted for three years, taking almost 2 points off GDP in 1992 and again in 1993. 1998 saw a similar contraction. 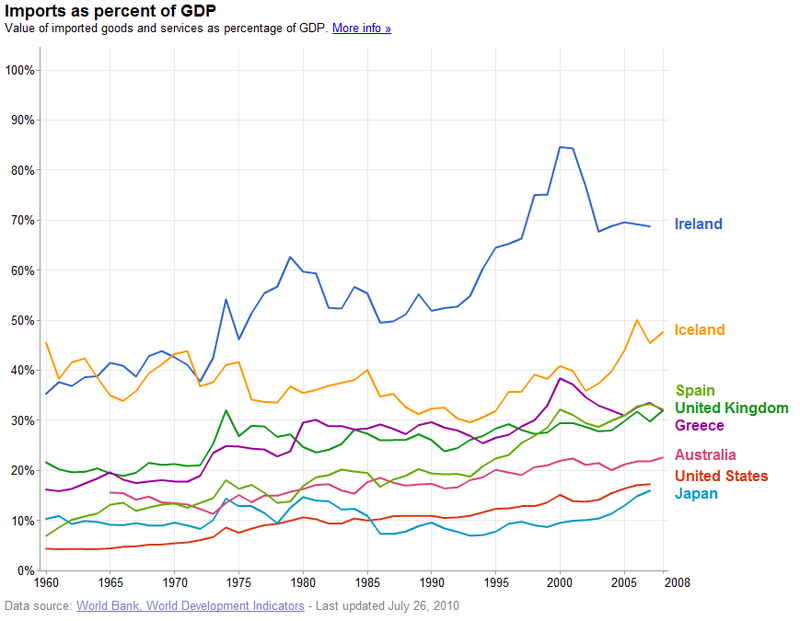 In the US, investment was usually over 1% in the 1990s, but made a surprisingly small contribution to GDP in the mid 2000s housing bubble years (not much more than 1%, so much less than Japan's bubble-era investment). 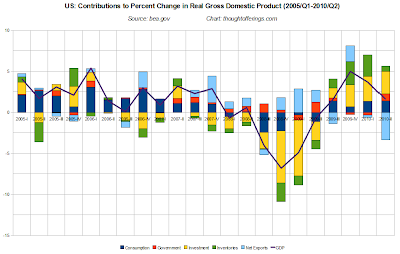 However, contracting private investment was the biggest contributor to falling GDP in late 2008 and early 2009. Late 2009 and the first half of 2010 have seen large a large bounce back in investment, perhaps reflecting the depth of the decline. Where might it go from here? I'll save that for a future post on outlook, but there is no obvious answer based on these charts alone. 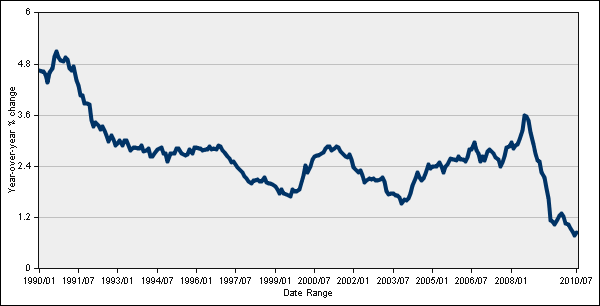 Changes in private sector inventories are the primary driver of typical recessions and business cycles (if inventories are increased by too much as optimism gets ahead of reality, the recession allows the inventories to be drawn down, but reduces income to manufacturing and other contributions to inventory growth during the recessionary period). But in balance sheet recessions arising from debt-fueled asset price bubbles, inventory effects are dominated by other factors, particularly private investment. 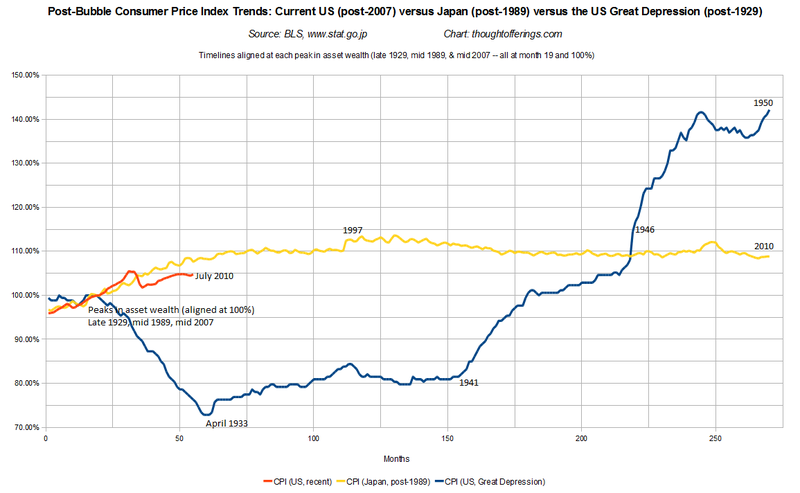 This is evident in the Japan chart from 1990-1993 and the US quarterly chart in 2008 and early 2009. To compare to more typical recessions, look how much larger the green (inventories) is relative to the yellow (investment) in the US in 2001, 1982, and 1980. There has been a huge inventory rebuild in the US in Q3 2009 through Q2 2010, so this effect will likely fade and be more neutral going forward (though with risk of renewed contraction in the immediate quarters ahead if the rebuild was too large or consumption falters further). One common statement about Japan is that they are an "exporting nation" and that this sustained them after 1990 and prevented a depression. But this chart shows that in the 1990s, changes in net exports were sometimes positive and sometimes negative, and did not dominate the trend in GDP growth at all. However in the 2000s net exports have made a moderate and steady contribution to growth every year from 2002-2007. Through most of the 1990s and 2000s in the US, changes in imports and exports exerted a mild drag on growth (i.e., imports rose faster than exports, as an increasing amount of income was spent on imported goods and services). This is a little surprising for the 2001-2005 period, as the dollar was falling most of that period. A deeper dive into the data could answer this, but on the surface it seems the growing demand for imports exceeded the increased competitiveness of exports. Perhaps China's currency peg was a dominant reason. Since 2007, growth in net exports has provided some positive support for US GDP growth. 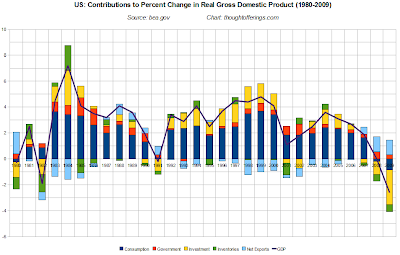 This was a limited comparison narrowly focused on one type of data set (contributions to real GDP) and not tied into historical accounts of the timing of recessions, government stimulus, etc. 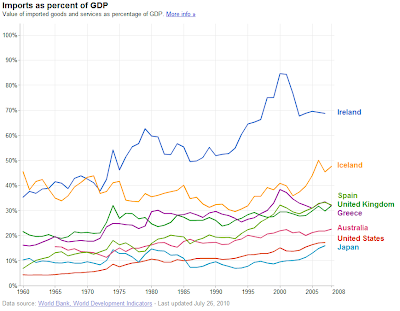 I'd welcome a bit more elaboration in comments on the real world factors that contributed to the GDP growth trends for each country and time period (or any other insights into the data), if anyone is inspired. As a future project, perhaps I'll eventually correlate these charts with changes in private sector debt and changes in government deficits. I decided this month to finally update my charts. The format carried over from my original post comparing historical deflationary episodes overdoes the Great Depression comparison, despite being useful at the time (a year ago, negative year-on-year CPI reports had prompted a renewed surge in deflation chatter). Rather than attempting to align all three episodes of data at a CPI peak, they are instead now aligned at the dates that wealth (i.e., asset values such as real estate and equities) peaked. 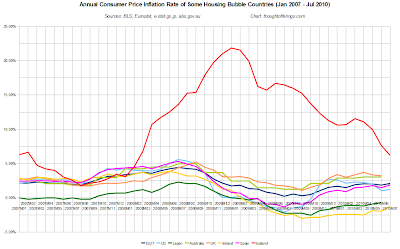 The goal is to compare the effects of the post-asset-bubble deflationary forces on the actual consumer price level trend in each case. I considered a few other possible alignment points, such as the peak in private sector borrowing (as debt-fueled asset bubbles tend to be the largest). However the peak private sector rate of debt-growth before the Great Depression was actually in 1925 (! ), and overall the peak in balance sheet wealth seemed the most logical choice. The main reason for this choice is that falling asset values (along with a post-bubble consumer mentality) typically induce a higher attempted private sector savings rate, which will typically cause an aggregate demand deficiency and lead to downward pressures on prices and wages. 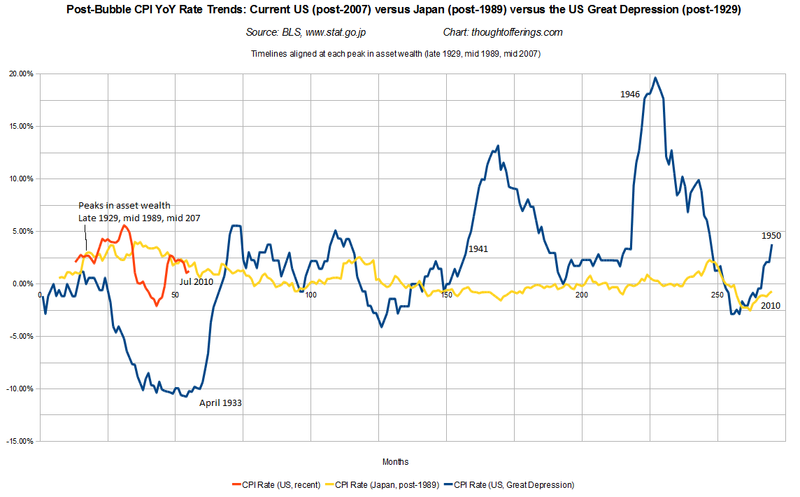 Some charts of balance sheet wealth in the US and post-bubble Japan are in this previous post. 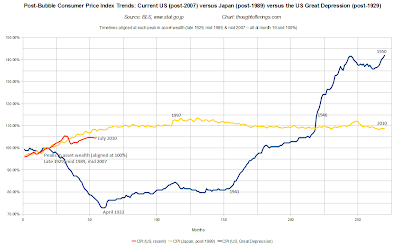 The rough peaks I used (these are not terribly precise) for the charts were November 1929 for the Great Depression, mid 1989 for Japan, and mid 2007 for the US. 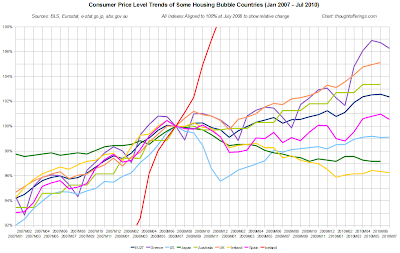 Risk of negative global demand shocks due to such factors as deflating global housing bubbles (real estate prices in many countries are still nearer peak than trough by price/earnings and price/income measures). 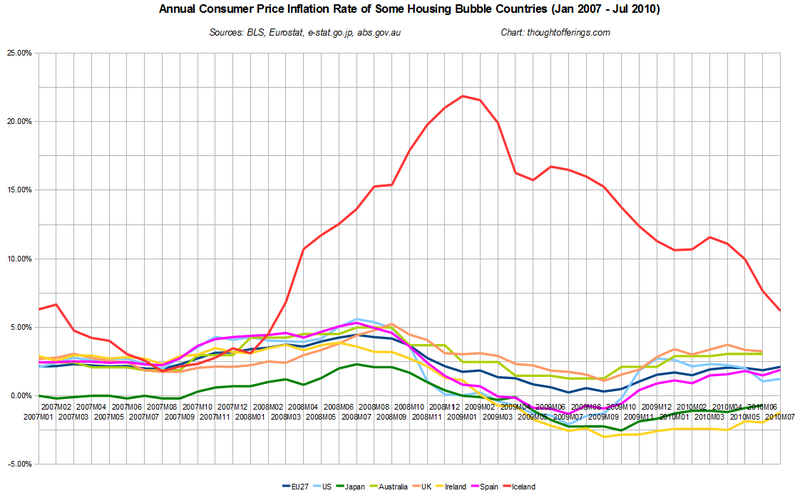 Still, it's probably premature to expect US deflation in the immediate months ahead. 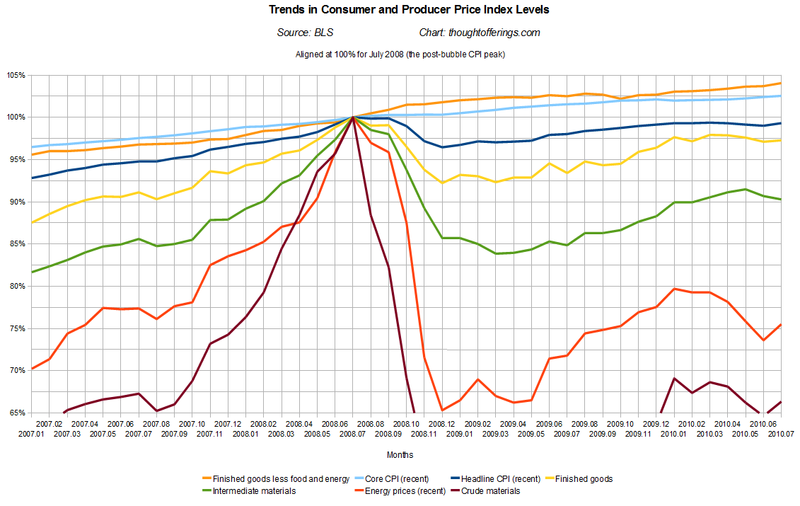 The chart above shows various CPI and PPI measures, aligned at 100% on July 2008 when the CPI peaked. 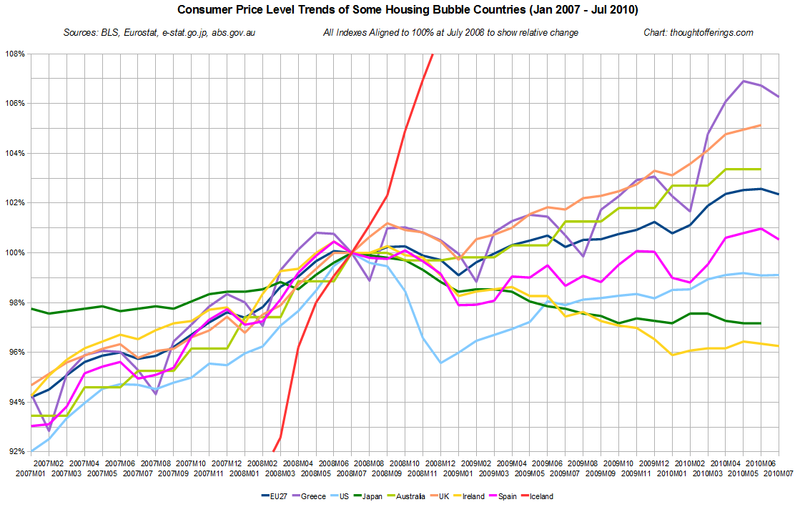 It is intended to help in comparing the trends in absolute price levels (not rate of change). 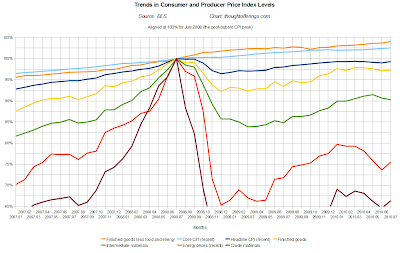 For example, crude materials (PPI) and energy (CPI) are clearly more volatile than finished goods (PPI) or headline or core CPI, but you can see at times (especially late 2008) how they can drag the other indexes around. 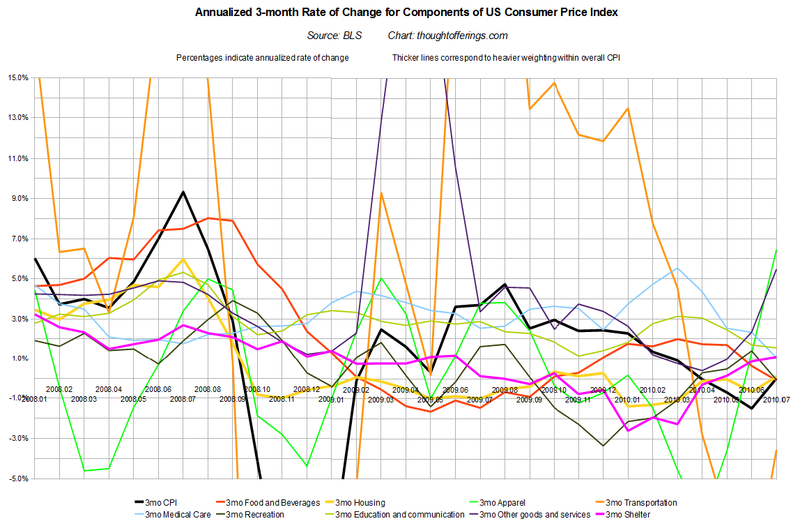 This chart shows the short term (three month) rate of change of the components of CPI, to help identify underlying inflationary and deflationary forces within the overall CPI basket. 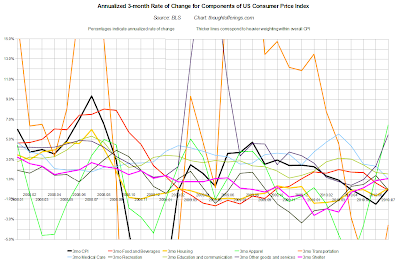 Many components are quite volatile despite being seasonally adjusted. A surprising number of components (food, housing, recreation, and overall headline) are showing a flat (0%) three month rate of change. 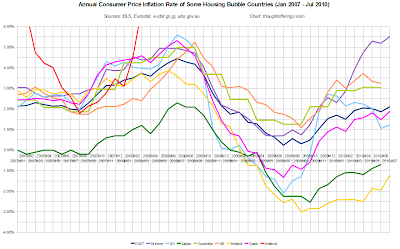 But shelter (a subset of housing I have separated due to its importance) has broken its deflationary trend and continues with positive inflation! I am still looking for a good explanation (Calculated Risk has commented a little but is also unsure of details). 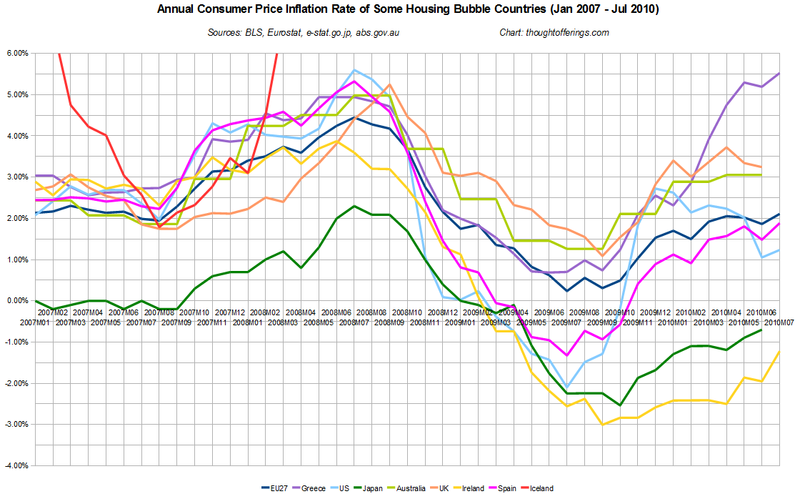 If this continues, it removes a lot of the near-term deflationary impulse on the overall index, and perhaps actual lasting CPI deflation is still years away like Japan's was (or perhaps even not at all).